With one of the largest fleets in Canada, we have a variety of single and double sea kayaks available to rent for all ages and abilities. Our diverse fleet consists of quality sea kayaks from the following brands: Necky Kayaks, Current Designs, Sterling Kayaks, Seaward and Atlantis Kayaks. 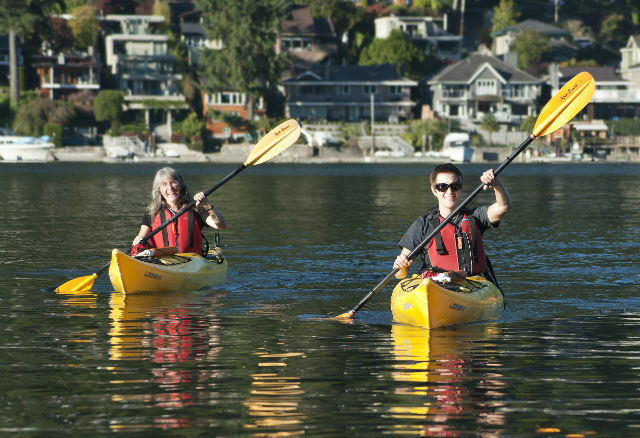 Experience kayaking in Indian Arm with our certified and experienced kayak guides. Join our daily 3 hour Deep Cove Explorer tour or customize a tour to fit your group with our Private and Group Sales department. If you want to learn how to kayak we have a lesson for you. Try out our beginner lessons or if you are an experienced paddler we have advanced and private lessons to help improve your skills. All ages and abilities can be accommodated through our lessons. Sign up today! For the best advice and quality service, be sure to check out our retail store, Deep Cove Outdoors. Our knowledgeable retail staff are dedicated paddlers who know their stuff when it comes to paddling. We sell new and used kayaks, all kayak accessories and lots more. If you are looking to take out a school or community centre group, corporate team or language school on the water, we can cater for your group's needs.